After leaving the port in Vancouver, British Columbia, Canada, our cruise ship, the Celebrity MILLENNIUM headed up through the inside passage for our first port of call in Sitka, Alaska. It was in Sitka that the ship took on the fuel we would need for our eight straight sea days before reaching Japan. Half way through those eight days we are scheduled to cross the International Date Line where we will lost an entire day in a moment’s notice. Yes, this year the month of September has only 29 days in it while on the ship; there is no Friday the 15th! One of the things that Sitka is known for is the strong Russian cultural heritage. 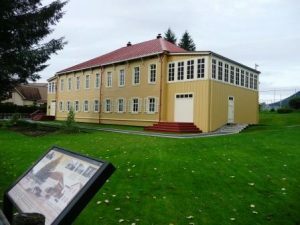 Given that Alaska was actually “Russian America” until it was purchased in 1867, there was and still is quite a Russian presence in the town. Most of what you will want to see on a short visit to the town is on Lincoln Street that runs mostly parallel to the harbor line. You can visit the Sitka Convention and Visitor’s Bureau at sitka.org. St.Michael’s Cathedral sits right in the middle of the “fork in the road” along Lincoln Street as it makes it way down past the shops toward City Hall and Castle Hill. The original cathedral was destroyed by fire in 1966, but fortunately most of the relics, treasures, and paintings were saved by the locals. It took ten years to finance and rebuild and exact replica of the old cathedral, and today’s building is worth a short stop to look inside (and to take photos of the front of it. Just to the right of St. Michael’s (as you face its front) is the Lutheran Church (of Finnish origin) and with its 1844 Kessler organ from Estonia. It has an interesting mix of glass treatments on the inside. Continuing down the street, and down the hill toward the water, on Lincoln Street, you’ll come to a nice grassy park area in front of Pioneer Home. This state home was built in 1934 for elderly Alaskans and it’s on the National Register of Historic Places (visitors are welcome). 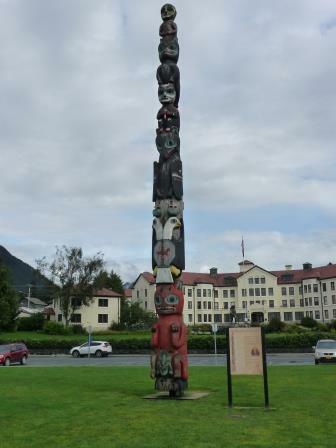 In the park area out in front of the Home is Totem Square, punctuated by a tall totem pole that displays the double-headed eagle of Sitka’s Russian heritage. The plaque gives the chronology and the history of the Baranov Totem Pole. Going back up Lincoln Street past the main stop light (the only one?) you’ll see the Russian Bishop’s House. 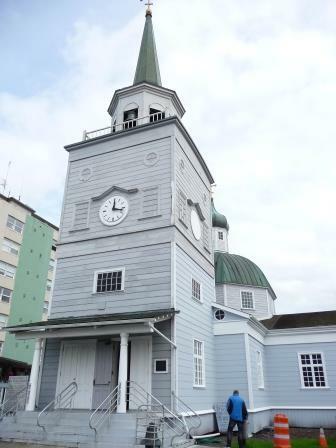 This is a National Historic Landmark Site, and it’s the oldest intact Russian building in Sitka. 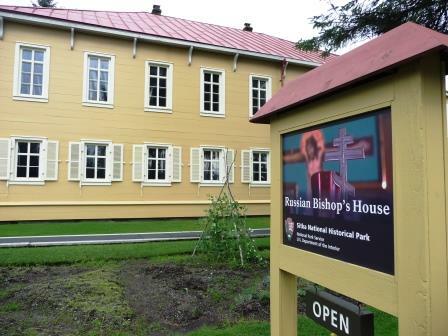 It was built in 1842 by the Russian American Company (remember that what we now call Alaska was called Russian America before its 1867 purchase by the USA) as a residence for the bishop of the Orthodox Church. When you’re in Sitka, you’ll notice the proximity, about a quarter mile, of the Bishop’s House to St. Michael’s Cathedral back down Lincoln Street. Our time in Sitka was short, but it was nice to be able to stretch our land legs as we would be using only sea legs for the next eight days!